Karan Johar and the Bahubali team launch the film's first trailer. 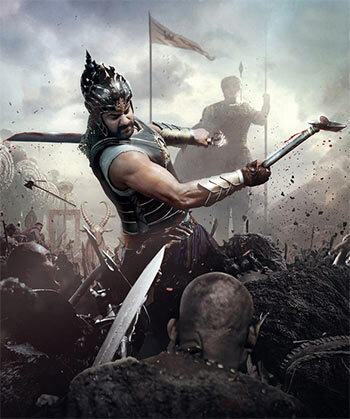 The first trailer of Telugu film Bahubali was launched with much fanfare on June 1. The team flew down to Mumbai to unveil the first trailer of the much-awaited film. Among those present were director S S Rajamouli, actors Prabhas, Rana Daggubatti, Tamannah and Anushka Shetty, and producer Karan Johar, who will present the film in Hindi. "I am in awe of Rajamouli's work. His films are amazing," Karan Johar said. "The way he has presented his work on celluloid is jaw-dropping and something that every filmmaker in the world should emulate. I am really proud to be a part of Bahubali." The film has been in the making for more than three years and the actors have shot for more than 380 days. Director Rajamouli said it was more than a dream to make this epic drama. "I am really excited and proud to present a film that I have lived with for so many years. Bahubali has been an emotional journey for me. I must thank my entire cast and crew who stood by me and who worked tirelessly for so many years. Without them, I couldn't have built the world of Bahubali," he said. The director added that his wife was a big support for him. "My wife not only did the costumes for the film but she made made my world of Bahubali become true." Johar's production house Dharma Productions has been associated with making family dramas and light-hearted romantic films. What convinced the director to present the film was to be associated with Rajamouli. "I have loved his previous films. His last film Eega was brilliant. He made an entire film on a fly. Here, it is difficult to make a good film by casting superstars also," KJo said. Why has Hindi cinema not be able to make an epic film like Bahubali? "We don't have a Rajamouli in Hindi cinema," Johar quipped. "He has given his life to making just one film and being a director, even I wouldn't do that." Then, he added in jest: "I have learnt from Rajamouli to stop judging reality shows and start directing." 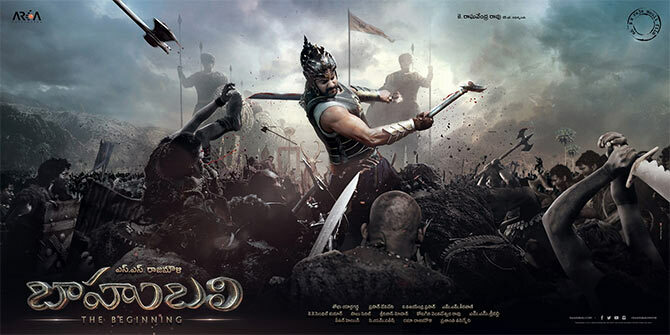 Although Rajamouli did not reveal the story in the trailer, he said the film is inspired from Mahabharata. "The story is inspired from the Mahabharata. All my previous films have references from Mahabharata or Ramayana, as these are two epics that I have learnt from childhood," the director said. Telugu star Prabhas, who plays the title role, said it was a dream role. "I had worked with Rajamouli 10 years ago in a film called Chatrapati. He had told me about Bahubali six years ago, and we have been working on it for last four years. It's a once in a lifetime kind of film." Rana Daggubatti, who plays one of the key characters called Bhallala Deva, says, "It was difficult to do Bahubali. What you see right now is a shunted down version of me. I was 25 kilos bulkier than what I am now. We prepared rigorously for six months before we started shooting." Anushka Shetty, who plays Devasena, says: "It was an exhilarating experience and a dream come true to work with Rajamouli. On the first day of the shoot, I just stood there listening to what he had to say. But I never realised the film would become so big." Tamannah adds: "Honestly, I had never dreamt of working with Rajamouli sir. When I came on board, they had already finished 180 days of shooting. Rajamouli is really a humble person. It's been an amazing journey." Bahubali is slated to release on July 10.